Hey Hey Local Readers! 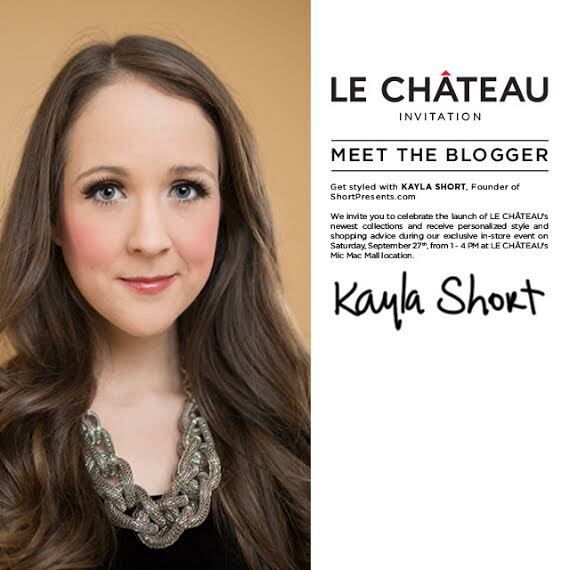 I’ve partnered up with Le Chateau again to bring you another “meet the blogger” event. I’m crossing the bridge for a little Dartmouth visit and I may or may not be giving away a gift card for $200 for Le Chateau! Who’s excited? This time around we’ve streamlined the event and we will be focusing on suiting. Of course you can ask me anything you know that, but for all you working gals out there make sure to come on out to the Mic Mac Mall Saturday September 27th from 1-4pm and hang out with me, and I promise will get you in tip top shape before Monday. Curious about what goes on at these events? Make sure to check out this previous post from my event with Le Chateau at Halifax Shopping Centre here. For anyone looking to get a little head start or can’t make it to the event for geographical reasons make sure to check out Le Chateau’s website or go here for plenty for work inspired looks. For all the folks that DO come out to the event (come on who doesn’t like free advice?) you could win a $200 gift card for Le Chateau, so make sure to stop by, and say “hi” because this bad boy could be all yours to spend as you wish! Did someone say free shoes? Can’t wait to hang out with you! And don’t be shy 🙂 make sure you say hi!